BERLIN (AP) — When Hilde Schramm inherited several paintings collected by her father, Hitler’s chief architect and Armaments Minister Albert Speer, she was only sure of one thing: she didn’t want them. Despite determining they probably hadn’t been looted from Jews during World War II, she wanted their legacy to somehow benefit others. So she huddled with friends around a rickety green table at her home-office in Berlin and came up with a plan to sell them and use the proceeds to support Jewish women’s creative projects in Germany. In 1994, that became the Zurueckgeben foundation, a project for which Schramm received an Obermayer German Jewish History Award on Monday. The honor was established by an American Jewish philanthropist to recognize the efforts of non-Jewish Germans to keep alive their nation’s Jewish cultural past. The foundation’s name translates as “return” or “give back” but also can mean “restitution,” and Schramm said it was intentionally chosen to emphasize its goal of raising awareness at a time when looted Jewish property and art was a little talked-about issue. “It was very much our point with this word ‘Zurueckgeben,’ which in a way is a provocation, because in a way nobody really can give back, to raise consciousness about the injury that had been done very broadly in Germany,” she told The Associated Press. But most of the focus has been on the big-ticket items like precious paintings and sculptures. Schramm’s foundation encourages Germans to take stock of the more mundane items in their households and question where they came from. In part it’s to fight the cliche perpetrated by the Nazis that all Jews were rich and powerful, and also to dispel the notion that only the Nazi elite profited at the expense of the Jews. Because it’s almost impossible to determine the original owners of smaller items like cutlery and furniture, donors to the foundation often give a symbolic amount to Zurueckgeben, or sell the items and give the proceeds. Since it began, hundreds of Germans have donated and the foundation has been able to pay out some 500,000 euros ($570,000) in grants to support more than 130 Jewish women’s projects. Those include a children’s theater, exhibitions, dance shows, books and films. The 82-year-old Schramm, a former Greens party state lawmaker as well as an educator and author, has been involved in several other projects related to Nazi-era commemoration and atonement. She was previously honored by Berlin with the Moses Mendelssohn Prize, named after the Jewish philosopher and given to honor people for fostering tolerance. She has also helped organize a nonprofit association to support projects in Greece after the Greek financial crisis, and has hosted seven refugees from Afghanistan and Syria in her own home. That followed German Chancellor Angela Merkel’s decision to open the country’s borders to more than 1 million migrants in 2015-16. “Wherever I went, whatever I did, I saw something which was a blind spot and I took it up,” she said. Schramm was only 9 when the war ended. Even though she was there at times with her father as he rubbed elbows with Hitler and other top Nazis, she said the persecution of the Jews was not something she was aware of. 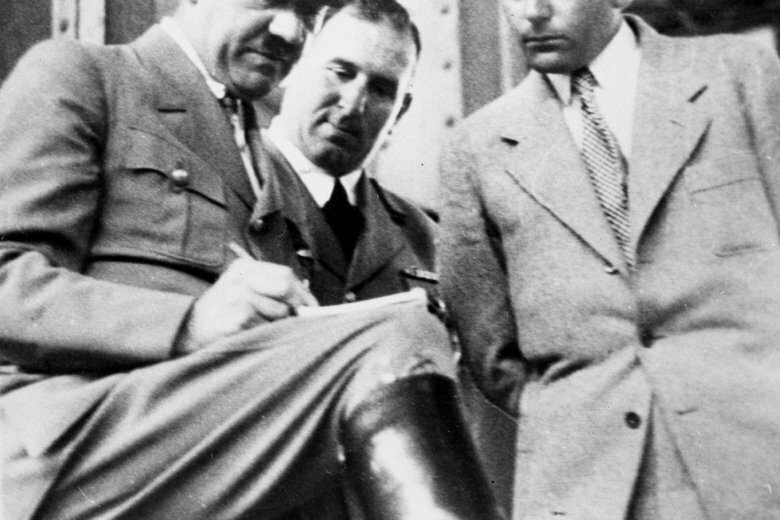 Unlike many other top Nazis, who committed suicide or were executed after the war, Albert Speer served 20 years in a Berlin prison for war crimes after being convicted in the Nuremberg trials. At his trial, Speer, who died in 1981 in London, accepted moral responsibility but insisted he had not known of the Holocaust — a contention that many have questioned. Schramm was able to talk with him and confront him with her questions, which was an opportunity she said a lot of the donors to her foundation never had with their families. Schramm’s award was one of six presented by the organization philanthropist Arthur Obermayer established in 2000. Obermayer was inspired by the help Germans gave him in researching his German roots. He died in 2016.